I begin things all year long, not just in January. But so many things start up in January and things are much calmer than November and December - so it's a good time to start new things. I've decided to join the Eat From The Pantry Challenge hosted by Money Saving Mom and Life As Mom. We just went to the grocery store and Costco the other day. Hubs mentioned that we should try to watch our pennies for a couple months and I mentioned this challenge. He said, "DO IT!" So I am - LOL! I am blessed with a hubs that doesn't mind what we have for dinner (or breakfast or lunch) just as long as I come up with something! ~ Only buy dairy products and produce as needed in January (and stretch them further). ~ Plan meals using what we have and make substitutions in recipes if necessary. ~ Try to avoid eating out with the following exceptions: Dad will visit and we'll eat out a few times; We will take BIL out for his birthday. That's it! I'll try to post weekly about how it's going. I don't have all my meals planned out, but I know there are lots of options. I might not be able to try many new recipes this month as they might require ingredients I don't have. I do believe this won't even affect my ability to do Chocolate Fridays (I already have a couple things ready to go for January anyway)! If you decide to join the challenge - head over to Money Saving Mom and link up your post! You don't even have to do the challenge for the whole month. I'm starting a couple of other things too. Why not, right?! I am going to try to keep up with Fresh Year, Fresh Start at Run the Earth, Watch the Sky. This week I'll be working on getting up early again to have my quiet time with the Lord first thing in the morning. 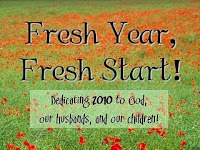 And I have joined Ten in 2010 at Recipe Girl to focus on getting healthy during the first 10 weeks of 2010. I've posted about that on my other blog: Stop Eating All The Chocolates. If you're interested in weight loss struggles, healthy recipes, or just trying to counteract chocolate calories - LOL - you can check it out. I think that's all I'm beginning - this week anyway! :) Lord willing, my Dad will be here to visit this week so I'll be busy. I hope all of you have a fantastic week! I'm linking this up to Your Life, Your Blog at Real Life - stop there to link up your favorite post for last week and read some other good posts! What new things are you beginning? You are ambitious my friend. I'll have to check some of those out. Big I've stopped before I've even gotten started size hugs to you! I wish I could do this! I am eating from my pantry this week, but I have basically been doing that fo so long that I simply HAVE to get to the grocery store. :-) I am even out of tomato sauce. LOL! Wow! Lots of goals! :-) I'm also doing the Fresh Year, Fresh Start challenge. Here's to a disciplined and productive 2010! Well, if I'm going to eat from the pantry it looks like nuthin' but mac and cheese! Hello friend - sorry I have been MIA so long! Soooooooo... sad I'm not going to meet you at Relelvant - ahhhh...when, when?! Great goals Lisa...I have a well stocked pantry too, and I could make it through more than January on what's in there, but I can tell you this...we'd be eating alot of pasta, bean and tomato sauce based recipes, lol...we'd get our licopene intake for sure! Lisa, you inspire me. Not eat out AT ALL?!? I think I would go through Starbucks withdrawals. Sounds like I should be doing this along with you, huh? Good for you! It looks like we'll be Eating From The Pantry this month also...I may have to do without the dairy products, though! LOL We are down to the nubbins right now, Real Estate is so slow this time of year...God will see us through somehow, I am confident! It sounds like a wonderful list. Especially the getting healthy thing. I'm going to have to join you there! what a great idea - only the other day i looked in my pantry and wondered when I would use up all the tinned food - now it is time to start. As we are replacing our fridge I need to also clean out the freezer - so I will start eating our way through that. We are doing the eat from the freezer and pantry challenge but it is motivated more by the fact that I don't want to move a lot of food. We have a freeze on buying ANYTHING that isn't consumable or absolutely necessary until after we move on Feb 1. Good luck to on all of your new starts. We are eating from the pantry (no trips to the store and we only eat out 1-2 times a year, and my birthday and anniversary are a long way off, so. . .) and we hve lots of great mals planned. I even made chocolate cookies this last week; I'll link them to your chocolate recipes next Friday.